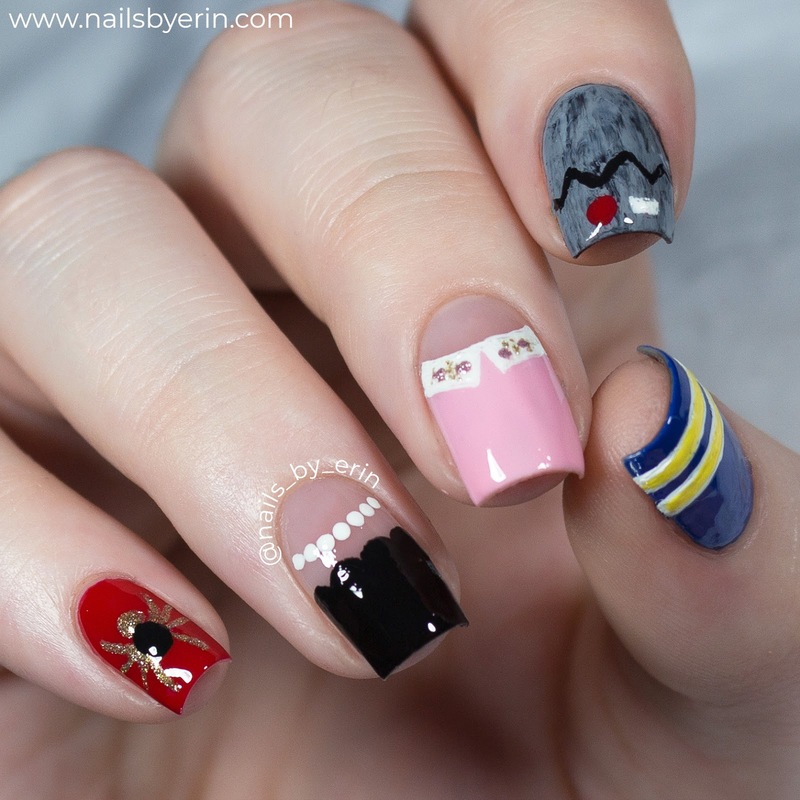 Since so many of you loved my Stranger Things Nails, I figured I should keep the series going and do another design inspired by a famous TV show... So this time I did nails themed around The CW's Riverdale! I did each nail inspired by one of the main characters on the show. On my pinky, I did a nail inspired by Cheryl. She is always wearing red, so I started with a red base (Color Club "Cadillac Red"). Then, I painted her black and gold spider brooch over it. My ring finger is inspired by Veronica and a dress she wore with a scalloped collar. Then, I used a white nail polish to create some white pearls above the neckline, since Veronica loves her pearls. My middle nail inspired by Betty. Her girl-next-door look consists of a lot of cute pink sweaters, so I took some inspiration from Season 1 Episode 2 and recreated her pink sweater with an embellished white collar. The pink nail polish is Color Club "Sugar Sheer". My index nail is inspired by Jughead, so of course I had to recreate his iconic crown beanie. I don't have a deep gray polish that matches his beanie very well, so I used a black and a light gray polish to create this messy, textured look instead. On my thumb, I painted the stripes from Archie's varsity jacket. I used Essie "All the Wave" as the royal blue base. I actually like how these came out! 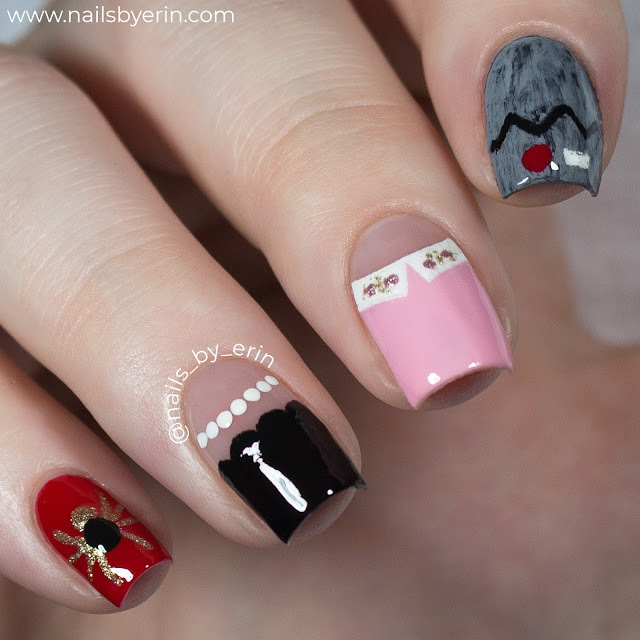 I think each nail represents the style of each different character well. Sorry if I missed your favorite character! 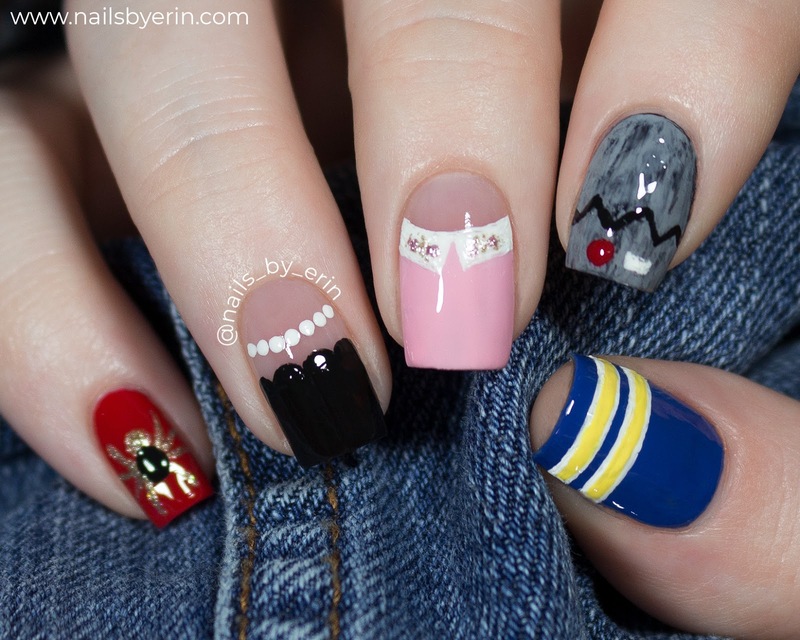 I know there are a lot of other Riverdale favorites but I only have 5 nails, haha. I tried to incorporate the most prominent characters in the show. 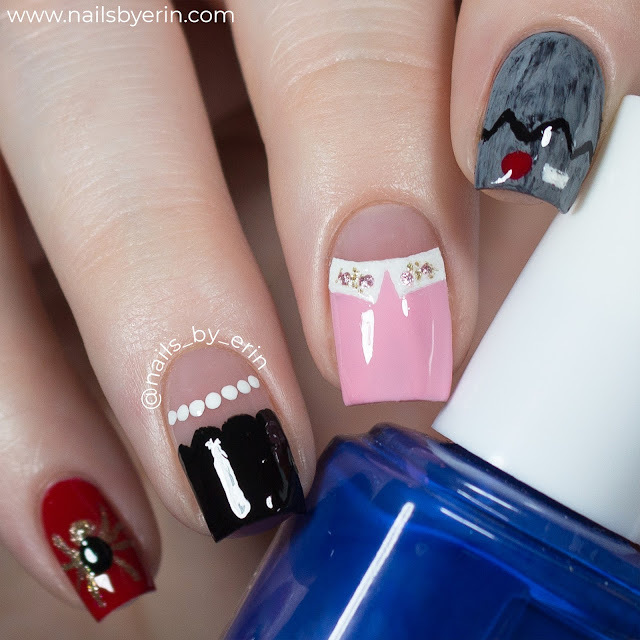 I hope you guys like this nail art! Let me know if you want to see more TV show inspired nails in the comments here or on my Instagram. I think it could be a fun recurring series for me to do.